The election results are a sad outcome for millions of people who had hopes for something different. Many fear that the hate and divisiveness of Donald Trump — the candidate – will remain with Donald Trump — the President. Much of this trepidation around the results of this election stem from fear: fear of hatred directed towards them, fear of not being accepted in this country, fear of violence, fear of losing a decent, safe, and stable life in this country. No doubt, Trump’s offensive language throughout the campaign was used to appeal to certain segments of the electorate. But it caused great hurt for other segments of society. The hurt people are feeling is not because of policy related positions or differences in politics. Rather, the hurt comes from a candidate who regularly insulted and attacked the essence and core of who a person is, of who an American is. Today there is a greater climate of fear surrounding whose family could be torn apart, Muslims who fear backlash fueled by Islamophobic rhetoric or women who fear that a kind of disrespect long considered inappropriate has all of a sudden become ordinary. The list goes on. Maybe the overarching fear that has overwhelmed part of the electorate is that many people now believe America is not for them anymore. Mr. Trump, may not have said something that he thought was offensive, but his words have offended many people and it’s important to recognize that people are hurting and are very afraid. As the comedian Louis CK once said, “if someone says you hurt them, you don’t get to decide that you didn’t.” So the first step for the next administration is to acknowledge that some Americans felt marginalized by Trump’s words throughout the campaign. At the very least, Mr. Trump and his administration must address his supporters and make it clear that bigoted and racist views towards minority communities is unacceptable always and forever. And that acting on these views is even more reprehensible. Let’s take a moment to understand where his divisive rhetoric may have come from and why it might have been used.. While we are fearful of our place in society given the extreme rhetoric used by Trump, we must recognize that Trump’s supporters were also motivated by their own kind of fear that is probably no less existential for them than ours is for us. There is a large segment of America that feels like it has been forgotten. Trump has seized on this and was not shy to use politically incorrect, xenophobic language to stoke the darkest parts of this part of our community into action. Now as President he must assure his voters that campaign rhetoric does not equal reality, and that legitimate grievances against a bloated and out of touch establishment does not mean that personal attacks, xenophobic comments and focusing hate on Muslim or any other community is okay in any way. Also, while Trump may have behaved in certain ways, that doesn’t mean anyone who voted for him is like him. We should hesitate before labeling all Trump supporters as racists. It’s not yet clear that his bigoted positions are what pushed his candidacy towards success. There needs to be a separation from him and the people who voted for him. Muslims in particular should make a distinction between people who vote for Trump and the language that he used to motivate some of his voters. And assuming that one equals the other is a misunderstanding of our politics and our country. People voted for Trump for many different reasons. 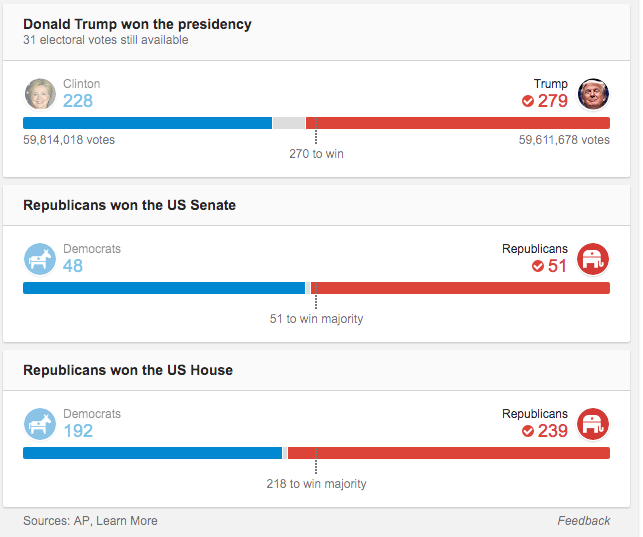 Keep in mind that the key states that pushed Trump to victory, Florida, Pennsylvania, Michigan and Wisconsin, were the same states that pushed Obama to victory four years ago— which means there are hundreds of thousands of Americans who decided to vote for both Obama and Trump in the last four years. Racist rhetoric hardly motivated these people. If Muslims want to be politically enfranchised then we must gain a deeper understanding of the results and the takeaways of this election. Perhaps American Muslims have misunderstood what it means to be engaged in a political process. While Hillary Clinton’s public embrace of Muslims during this campaign was heartening, our total lack of initiative in engaging Trump regardless of his rhetoric was a mistake. Engagement means talking with people who oppose us as well as support us. We didn’t do that this time around. While many of us see this as a dark day, and it is understandable why, lets take a step back and look at what it means for the future of American democracy. We’ve just elected an individual, who was an outsider, and who was not a career politician. He had limited support from the Republican party including previous presidents and he was consistently polling well below his actual support in the community. Despite all of this, he won because his message resonated directly with Americans who felt forgotten and disenfranchised. Part of what discouraged people from engaging in the political process is the insular nature of the political party system, where patronage carries more currency than vision. We should be encouraged by the fact that a candidate with a vision was able to circumvent all the constraints of the modern political system to elect himself President by speaking directly to and for the people. Now imagine that candidate with a slightly different vision. But finally, having been inspired by Hillary Clinton since I was as young as 13, I must ask on Donald Trump to recognize her assets as a healer and unifier and to call upon her and tap in to her to help bring the country together. She had devoted her life to public service, and it is sad to not have the chance to see her fulfill her visions for this country. 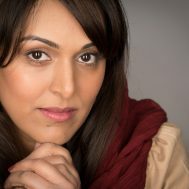 Amina Chaudary is the founder of The Islamic Monthly.